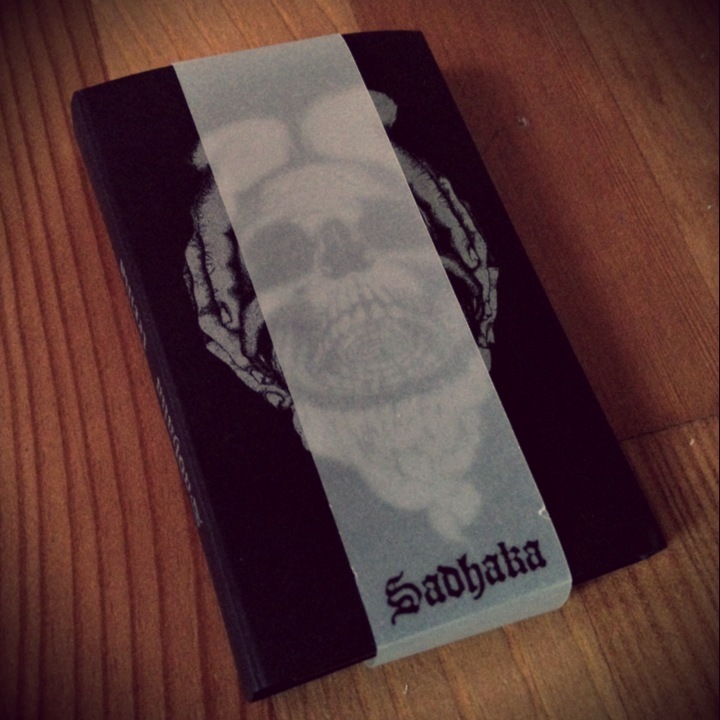 SADHAKA is a band from Cascadia. And just like quite some other bands from there, they know how to play exciting music. Needless to say that as much as the term “Cascadian Black Metal” became hyped during the last years, a lot of people started to blame basically every Cascadian BM band to be a bad WITTR-rip-off (at best) or hipster-BM (at worst). But acting like this makes you miss some great gems that are neither the former nor the latter. SADHAKA‘s Terma is one of those gems and in its overall conducting a really distinct one, too – if for the better or the worse lies in the eye of the beholder, as one might see later on. Instead of following the musical path Transilvanian Hunger laid almost 20 years ago – which means a steady blast-beat underneath monotonous, hypnotic guitar riffs – SADHAKA comes in quite slow for long periods, totally incorporating a considerable tendency towards Doom Metal. Of course there are a few uptempo passages that are built upon blast-beats as well, but overall Terma is a squelching, slow record. During these slow episodes SADHAKA has this very melancholic, almost depressive vibe going on that the US Black Metal band Weakling had as well. Especially the lead-guitarwork is somewhat similar to what’s happening in some songs of Weakling‘s Dead As Dreams, although both bands have a quite different approach altogether. Another outstanding element in SADHAKA‘s sonic approach is the really severe, vivid bass, which finds itself quite prominently in the mix. For SADHAKA the bass is more than just the typical fill-in to thicken the riffing. It’s the earthy ground upon which the other instruments can act out, the driving force that develops the four songs on Terma. The bass-sound itself is very natural and far away from the typical bass/sans-amp/pro-tools-crimes one can hear on way too many records. The vocals, performed by all members of the band, come across natural and very honest, too. Quite reverb’ish, but not exaggerated highly screamed or super deeply growled. Just pure, direct, painful cries. The last song Ancient Ones even surprises with beautifully sung, clean vocals that hit you in the face like a cold mountain creek in the summer. Terma has admittedly a certain melancholy to it, but is strangely life-affirming at the same time. Especially along with the lyrics, SADHAKA‘s music recedes from what is usually connected to the harsh, hostile legions of Black Metal. The second track Padmasambhava tells the story of the equally named sage guru from Oddiyana, northwestern Classical India. Padmasambhava is said to have transmitted Vajrayana Buddhism to Tibet, Bhutan and neighboring countries in the 8th century AD. 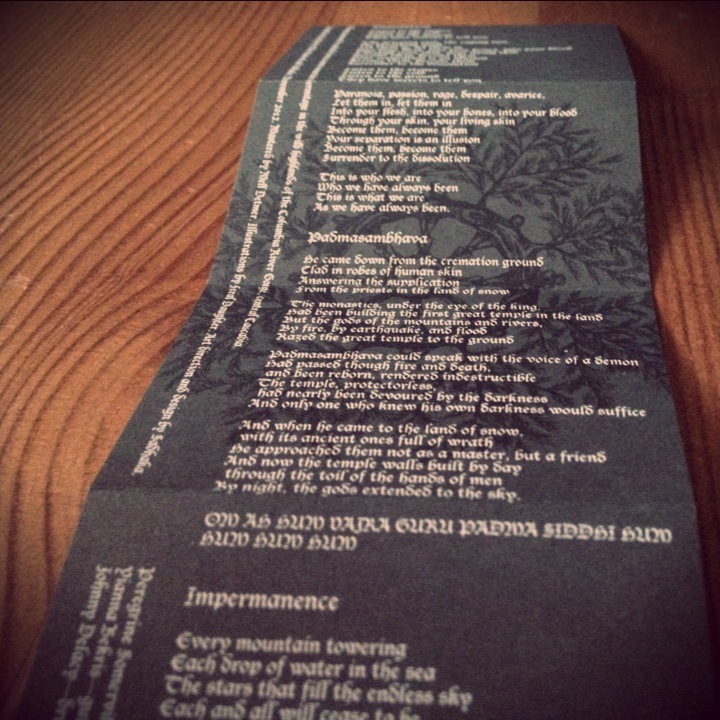 The song Impermanence deals with the never-ending cycle of emergence and passing that determines the way of the world. Needless to say, the idea of reincarnation is a fundamental one within Buddhism and older Indian philosophies. 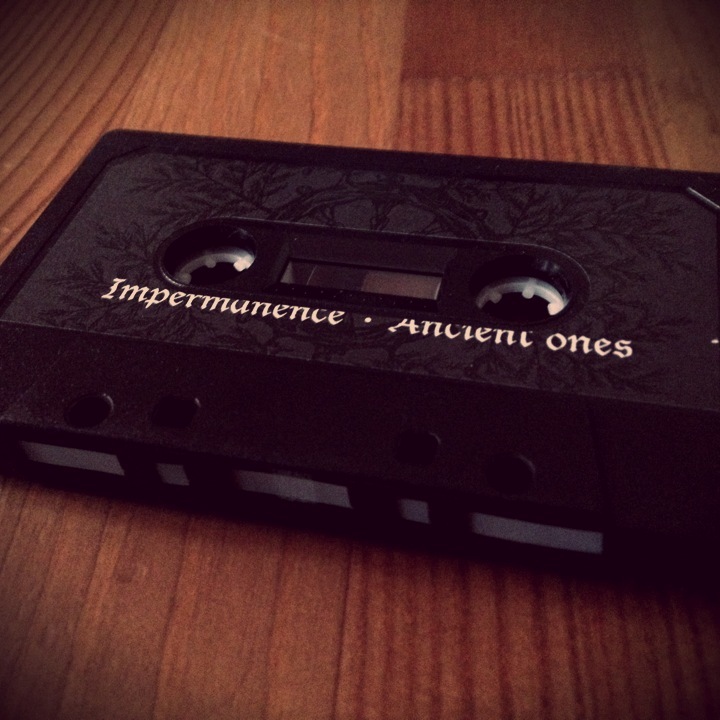 The final track Ancient Ones calls out for the restless souls of the decedents. Based on the assumption that Black Metal has to be anti-religious, SADHAKA is very far from being a BM band, although the music meets all the requirements. As for the lyrical content I can’t do otherwise but to express my distaste for religious stories that have been made up at some point in history and are sold as truth. I mean it’s totally fine if someone is in search for a deeper meaning in life (although personally I don’t think there is one) or for enlightenment of some sort. But why covering up these immemorial – and seen individually very interesting – philosophical ideas with religious fairy-tale and all kinds of mystical hoo-ha, especially in such an obvious way like SADHAKA does? That’s something I really can’t understand. If the other lyrics would be more in the vein of the first track Dissolution I wouldn’t even complain. Anyway, Terma is, like mentioned above, a grasping, exciting record with lots of very interesting ideas on the musical side of things. But it’s up to yourself if you can accept, tolerate or ignore the ideological superstructure expressed in the lyrics. 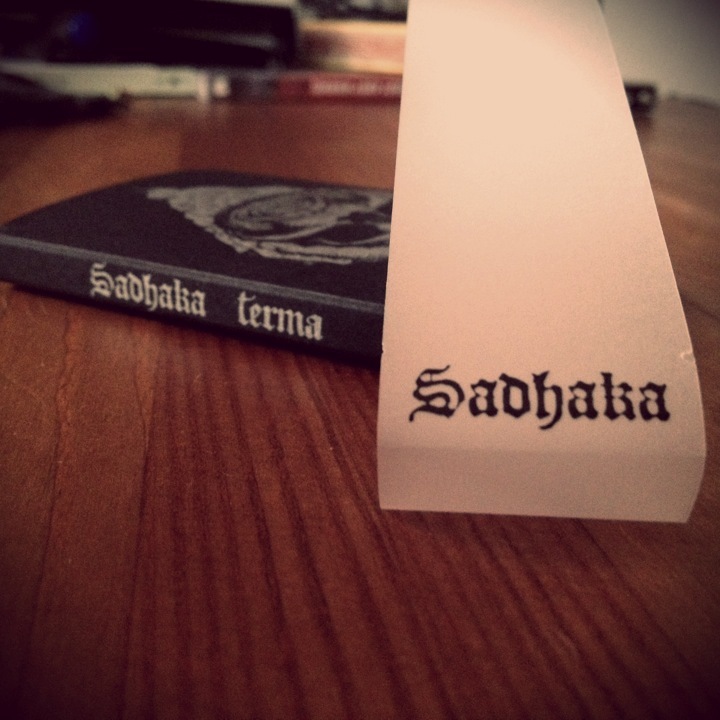 SADHAKA‘s Terma was released on tape by Sick Man Getting Sick Records, 200 pieces made.